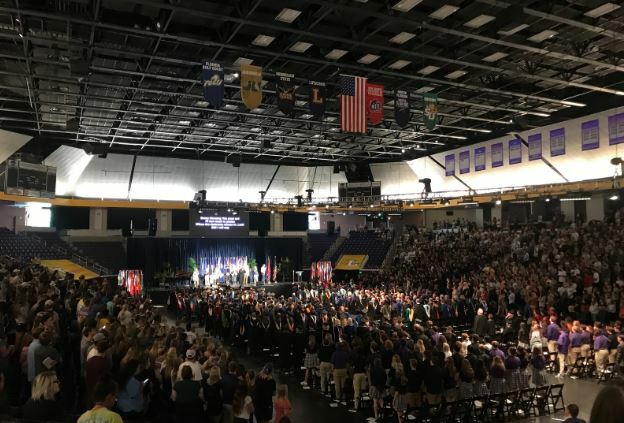 Lipscomb University’s Convocation began Tuesday when an array of flags emerged from the tunnels of Allen Arena, marking the continued increase of diversity at the school. But the flags were just a small part of the larger ceremony that served as a kickoff to the 2018-19 school year. Lipscomb typically holds convocation during the second week of the semester. President Dr. L Randolph Lowry III took the stage to address the improvements the school made this summer and to announce improvements to come in the future. Lowry praised his staff for their patience and hard work during the summer, which brought changes to the Bison Cafe and Bennett Campus Center and also included a total remodel of the cafe’s outdoor patio. Lowry spent time talking about Lipscomb’s history, which spans 127 years, and he also encouraged students to work hard and put God first during their studies this school year. But Lowry saved the best announcements for last, as he introduced Grammy Award-winning artist Michael W. Smith to play a few songs on the piano and to lead worship. Lowry also announced plans for a new, 200-space parking garage to be constructed near the Fields Engineering Center on the northwest corner of campus. Students, long-plagued with parking issues, erupted in excitement at the news. The garage isn’t expected to be completed until at least August 2019.